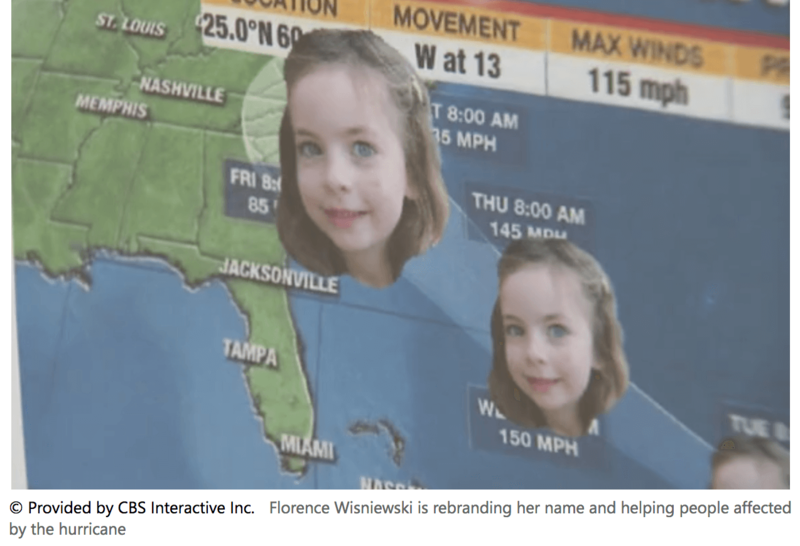 Photo Courtesy of CBS Interactive Inc.
Florence Winiewski wasn't about to let a hurricane give her name a bad rep. When 4-year-old Florence Winiewski heard her name all over the news, she was confused. She didn’t understand why people were talking about her. When her parents explained to her that people were not, in fact, actually talking about her, but rather about a dangerous hurricane, she wanted to give her name a better reputation. So Flo--as she is nicknamed--started collecting donations for victims of the hurricane. She put pictures of her smiling face on a map of the hurricane to bring brightness to the storm. She put a donation bin outside her house and received hundreds of dollars worth of non-perishable items such as food, diapers, and toiletries. "I think it's right to do. To help people," Florence told WLS.